Last major update issued on September 29, 2005 at 03:40 UTC. The geomagnetic field was quiet to active on September 28. Solar wind speed ranged between 334 and 396 (all day average 358) km/sec. Solar wind density is still significantly above average. Solar flux measured at 20h UTC on 2.8 GHz was 74.6. The planetary A index was 12 (STAR Ap - based on the mean of three hour interval ap indices: 12.1). Three hour interval K indices: 33422323 (planetary), 44421322 (Boulder). Region 10810 decayed slowly and quietly. Region 10812 decayed slowly and quietly. 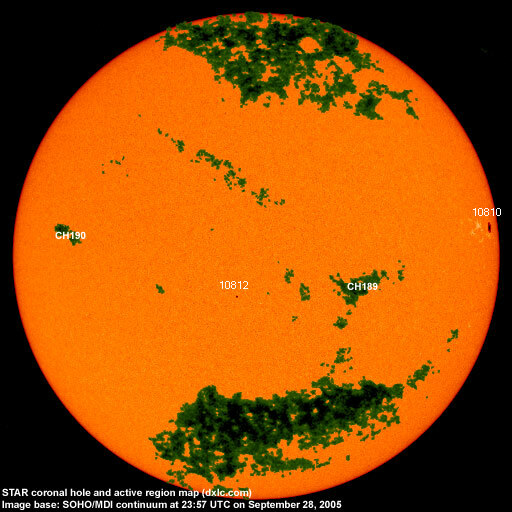 September 26-28: No obvious fully or partly Earth directed CMEs were observed. 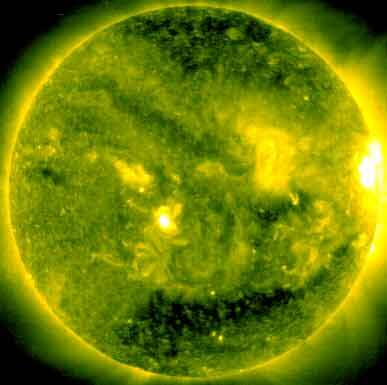 A recurrent trans equatorial coronal hole (CH189) was in an Earth facing position on September 26-27. 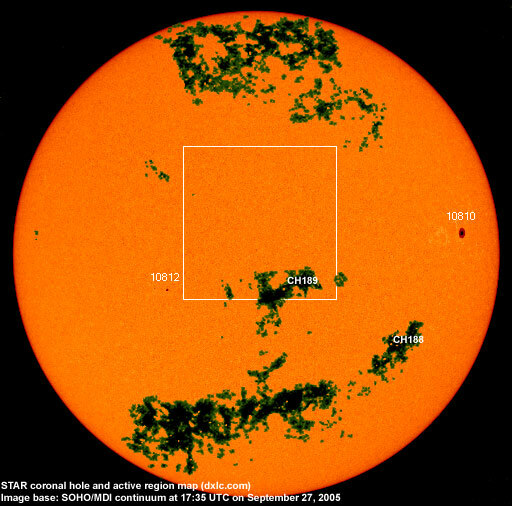 The brief appearance on September 26 of a spotted region in the western part of CH189 caused a reduction in the size of the coronal hole. A small recurrent coronal hole (CH190) in the northern hemisphere could rotate to an Earth facing position on October 2. Processed SOHO/EIT 284 image at 19:18 UTC on September 28. The darkest areas on the solar disk are likely coronal holes. The geomagnetic field is expected to be quiet to active on September 29-30 due to a high speed stream from CH189. Quiet conditions are likely on October 1-4 becoming quiet to unsettled, perhaps with occasional active intervals, on October 5-6 due to effects from CH190. Long distance low and medium frequency (below 2 MHz) propagation along east-west paths over high and upper middle latitudes is very poor. Propagation on long distance northeast-southwest paths is good. Trans Atlantic propagation conditions are normally monitored every night on 1470 kHz. Dominant stations tonight: Radio Cristal del Uruguay and Radio Vibración, both with occasionally strong signals. Lots of stations from Venezuela and Colombia were noted on other frequencies, e.g. 1070 kHz which had both Radio Mundial Zulia (Venezuela) and Radio Santa Fe (Colombia) with fair signals. Argentine stations were present as well with good signals from 1030 Radio del Plata and 1510 Radio Belgrano. Some stations from the Caribbean had nice signals as well with 1400 Harbour Light and 1620 WDHP best.